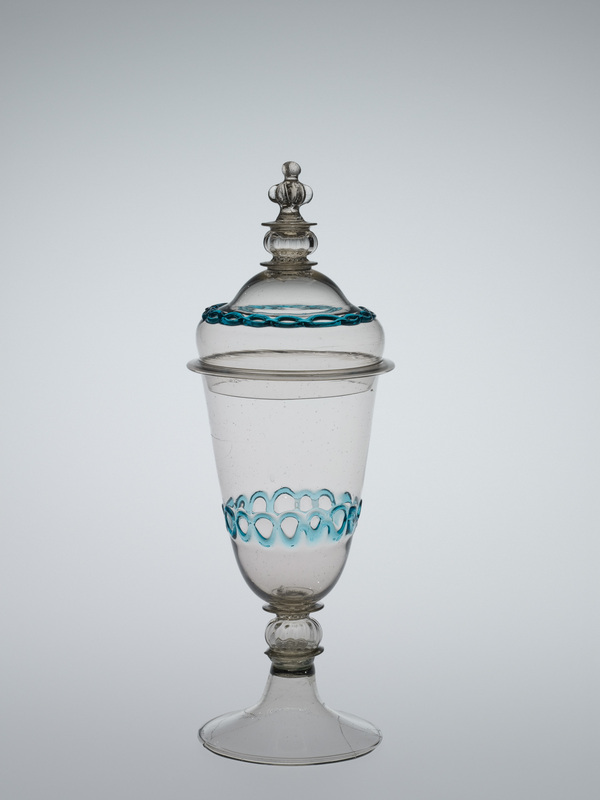 This lidded goblet has an aqua chain around the body, a merese, and a lid with a finial on the top. A moderate-size gather of glass is made on the end of the blowpipe. This will become the bowl or cup of the goblet. The gather is elongated and marvered to make it perfectly round and perfectly concentric with the blowpipe. When the glass is stable, air is blown in and a bubble forms. The tip is left thick, and it’s marvered again to cool the end of the gather. The glass is reheated. The tip is marvered again. A center point is pincered on the tip, the glass is elongated, and a neck or constriction is begun near the blowpipe. Next, the glass is inflated and pulled on to elongate the bubble. The neck is made narrow and is made sharply articulated so that it will break easily later in the process. The tip is trimmed, and the lower half of the bubble is reheated to soften the glass to allow it to be given its final shape. This vessel will have a slightly conical taper. A small amount of aqua glass is touched to the side and trailed around to form a ring. This is done again, and the two are reheated together. The pincers are used to squeeze the two rings together at intervals. The glass is thin and cools quickly, so it’s necessary to reheat frequently. This is how the chain is formed. The glass is reheated, and the vessel is given its final shape. A small bit of clear glass is added to the tip and tooled to form a merese. This will be used to join the knop and the rest of the vessel. Another small amount of glass is gathered on a smaller blowpipe, marvered, inflated, then lowered into a dip or optic mold, where it’s given ribs. This will form the knop. The bubble is lowered in place, centered carefully, and cut free of its blowpipe. The bubble is tooled to become an oblate spheroid. The excess is trimmed from the end. Another merese is added. A third bubble of glass is put atop the merese, lowered into position, centered carefully, and cut free of its blowpipe. The glass is spun to elongate the bubble, and a constriction is made near the tip, which will be used to create an opening. After reheating, the rim is formed. The soffietta (or puffer) is used to cool the knop and then used to further inflate the foot. After reheating, the foot is given a folded rim. With alternate reheating and tooling, the foot is given its final profile. The site where the punty will be attached is cooled. The entire vessel flashed deep in the furnace, and the punty attached. The cold pincers are held on the neck, and with a slight tap, the neck breaks. The edge is reheated. The original goblet has a very thin edge. To create that, a special lip-thinning procedure is used. At this moment, the thick glass is pulled out, a new constriction made, and the thick glass knocked off. The final opening procedure is begun after a reheat. The hole is dilated to about an inch in diameter, reheated, and the soffietta is used to inflate the uppermost part of the vessel body. The straightness of the sides is reinforced, the hole is opened a little more, the soffietta used again to prepare for the final opening. The diameter is checked so that the lid can be made to fit this particular vessel. The lid begins with a bubble of glass, the neck is formed, the tip trimmed. The chain is made as we saw before. A merese is added. A knop is added. Another merese is added. This is transferred to a punty. After reheating, the hole is dilated to a diameter of about an inch. After reheating, the hole is opened to a diameter of about an inch, and after reheating, the soffietta is used. After another reheat, the flange is made. This flange will sit atop the rim of the goblet. The shape of the lid is refined using the wood jacks. These slide easily over the glass and leave no toolmarks. Below the flange, the diameter must be carefully controlled so that it will fit the vessel. Lastly, a punty is added, the first punty broken free, and the finial is made. 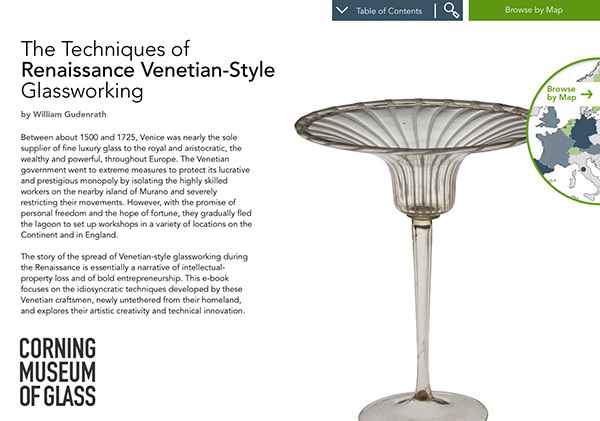 The finial is completed by adding a small amount of glass and tooling it to the proper shape. The jacks are used to create a spindle shape, and the pincer is used to create what is often called a propeller finial. A tiny amount of glass is added to the end for the very topmost part of the finial. After cooling, the lids and vessels are matched for size.